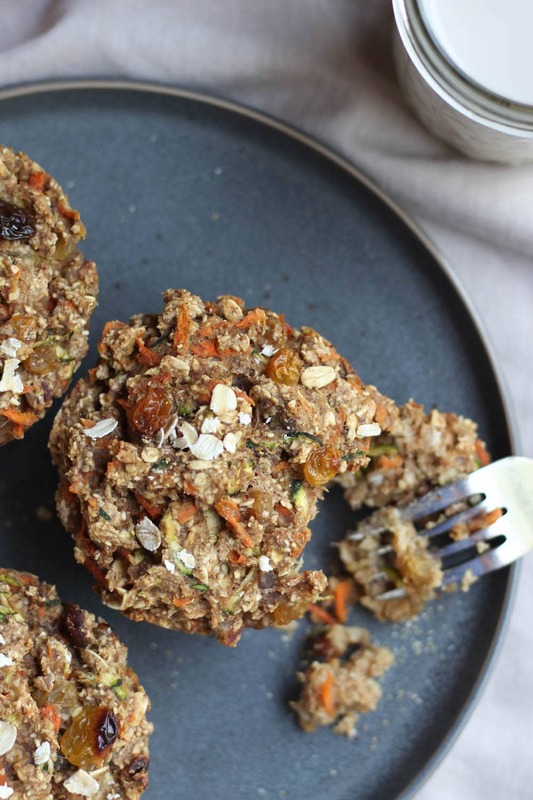 If you follow my Instastories, you would know how obsessed I’ve been with these Healthy Everything Oatmeal Breakfast Muffins lately. They’re just too perfect for my stage of life right now. I’m a new mom to little Harper baby and I don’t have a ton of time to spend on breakfast most mornings. Plus they have everything I want out of breakfast packed into a delicious, jumbo baked good. Well, to be honest, I usually do have enough time in the mornings to prepare a nice breakfast. Harper is on a fairly consistent schedule of sleeping from 8-9 PM unto 8-9 AM. I’m an extreme morning person and love to wake up between 5:30-6 AM, so if you do the math that sometimes provides me with 3 hours of “mom” time in the mornings! That’s definitely enough time to whip up a fancy breakfast, right?! It sure is! But I’ve found that I don’t like spending a lot of my morning free time making food for myself anymore. Making a nice breakfast used to be something I always took the time to do, but my priorities have definitely changed now that time to myself is limited. I would so much rather have more time to read and journal in the mornings than spend all that time making french toast or some other beautiful breakfast creation. 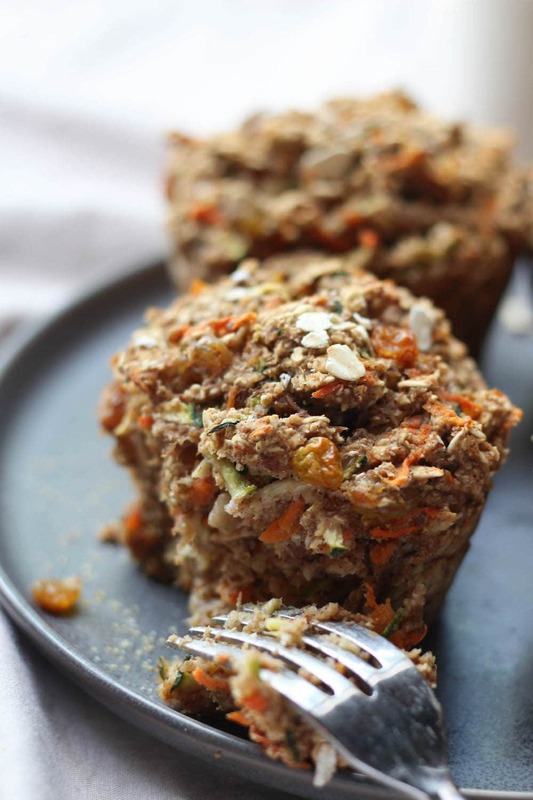 That’s why I’m so in love with these Healthy Everything Oatmeal Breakfast Muffins. They are made with all natural, whole food ingredients. The base is a mix of oat flour and whole oats. They are sweetened almost entirely with fruit with just a touch of maple syrup. 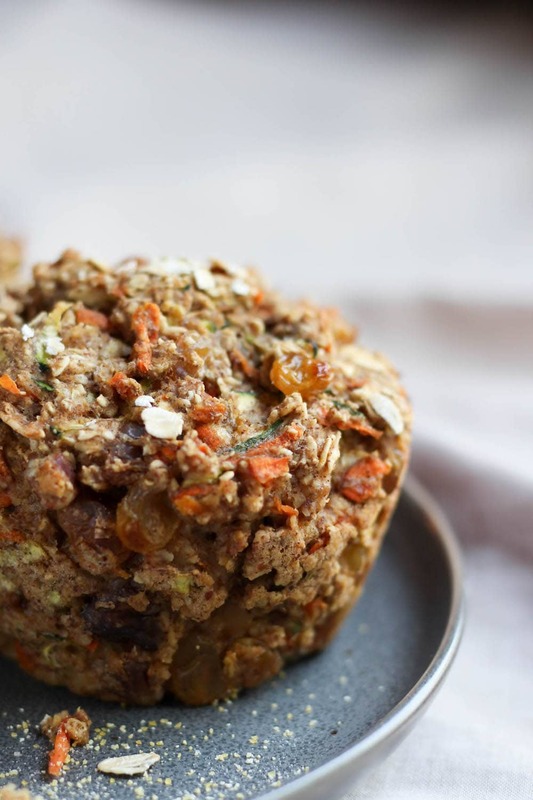 Then the addition of crunchy walnuts, juicy raisins and shredded vegetables gives these muffins so much texture and added nutrition! 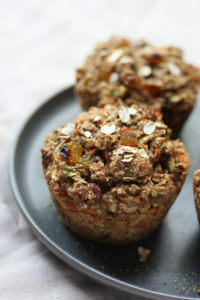 I love freezing a batch of these and reheating them for a couple minutes in the microwave when I need a quick breakfast. Pair them with some fresh fruit and nut butter and you’ll have a delicious, hearty breakfast in no time! I’d love to know if you give these Healthy Everything Oatmeal Breakfast Muffins a try and what you think! Leave a comment down below, rate the recipe, or even take a picture of the final product and share it on Instagram. Be sure to share this recipe with anyone else you think would enjoy them! Chock full of nuts, dried fruit, oats and shredded vegetables, these Healthy Everything Oatmeal Breakfast Muffins are a hearty and delicious way to start your day! Preheat your oven to 350 degrees and spray 5 jumbo muffin cups or 5 small ramekins with cooking spray. Prepare your flax eggs by mixing together 2 tablespoons of ground flaxseed and 6 tablespoons of water. Set aside to thicken. 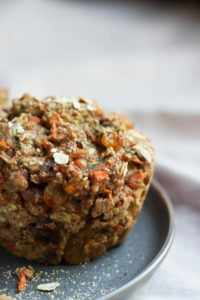 Place 2 cups of old-fashioned oats into a food processor or blender (leaving the remaining ½ cup of oats to add to the muffins later) and blend until a fine flour forms. Pour the flour into a mixing bowl. To the oat flour, add in the remaining dry ingredients, from the ½ cup remaining old-fashioned oats to the salt. Stir to combine. Grate your zucchini and carrot and coarsely chop into smaller pieces if desired. Place the zucchini into a paper towel or dish towel and squeeze out some of the excess water. Then add the zucchini and carrot into the mixing bowl with the dry ingredients. Add the remaining wet ingredients into the bowl with the dry ingredients and shredded vegetables and stir everything until just combined. 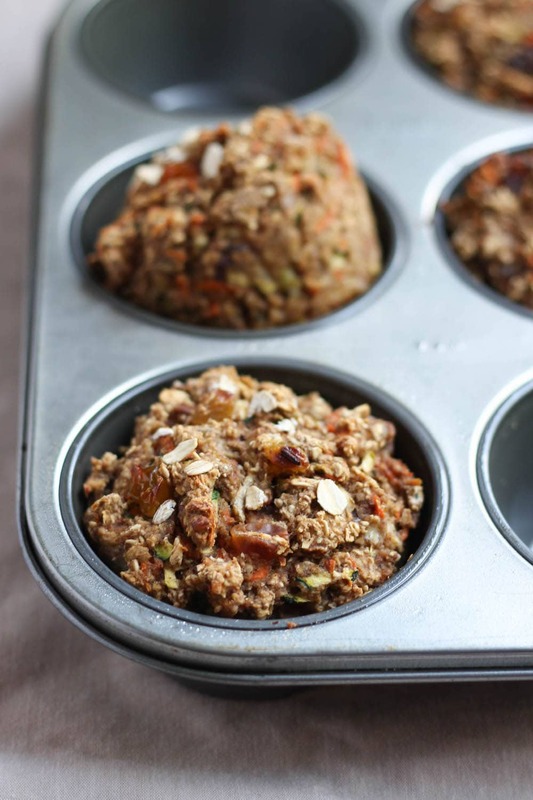 Divide the batter evenly among the prepared muffin cups. 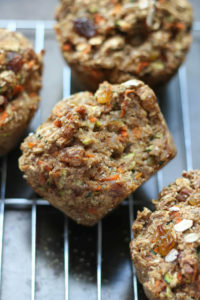 Bake the muffins for about 26 minutes or until a toothpick inserted into the center comes out clean. Remove the muffins from the oven and allow them to cool for a few minutes in the pan before carefully removing them and allowing them to cool completely on a wire rack. 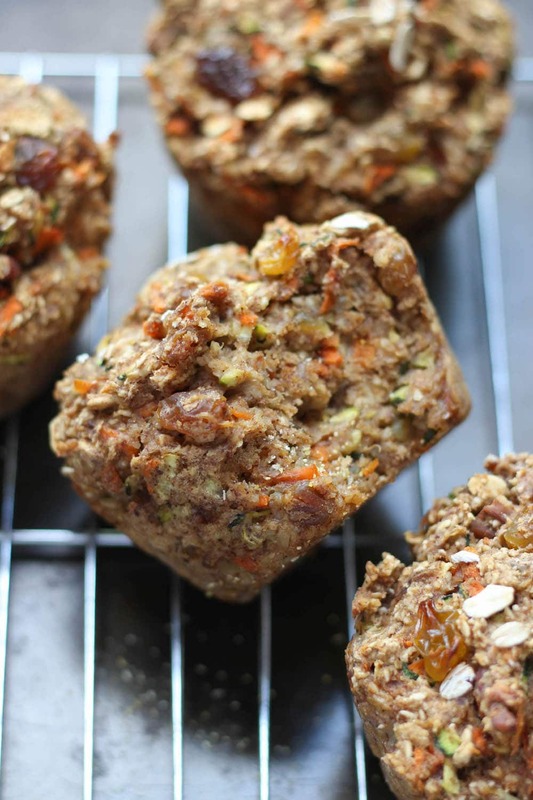 Store in an airtight container in the fridge for a few days or freeze them and reheat as needed. To reheat a frozen muffin, place the frozen muffin onto a plate and microwave it on high for about 2 minutes. I LOVE the ingredients in this recipe and spent 30+ mins looking for a recipe like this. I divided mine into 12 normal sized muffins and baked originally for 20 mins but put back in for another 5. However mine still came out a bit dense and wet in the middle. Suggestions? Hi again Sid! I responded to your comment then realized I thought you had commented on a different recipe! So I deleted my response and can now respond correctly. Sorry if you saw that first comment and we’re confused. Hmm, I’m not sure what happened. Sorry that they didn’t come out well for you. I normally bake mine as jumbo muffins and they come out fine. You could cover them with aluminum towards the end and bake them longer even. Did you squeeze the moisture out of the zucchini well? That makes a big difference! So glad to hear that Shirley! 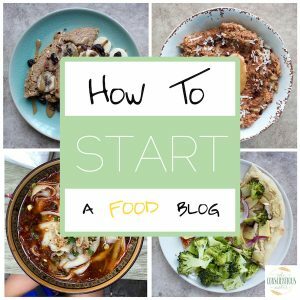 I hope you find some recipes you love! This recipe is amazing. So quick and easy and perfect for travelling. 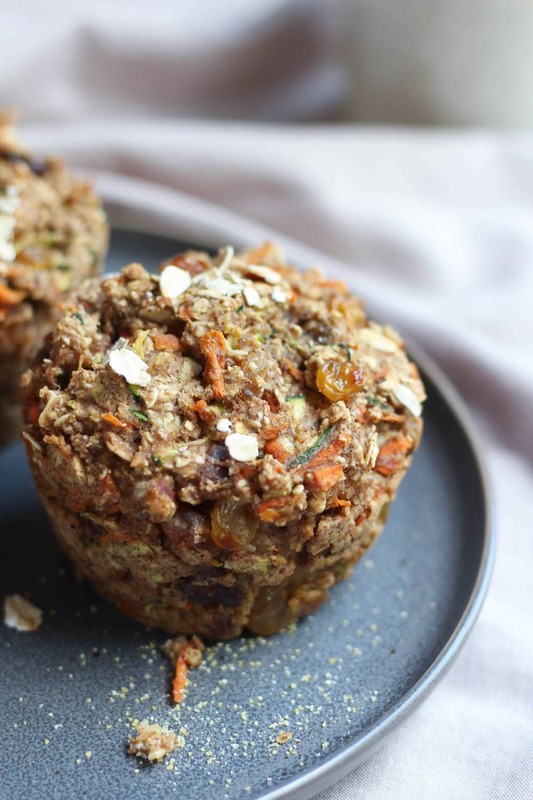 I recently went on a business trip and made these for my breakfast (knowing the hotel wouldn’t have plant based options) and they were so delicious with my morning coffee – plus an extra way to sneak in some veg. Highly recommend making them. Thanks Faith! So glad you liked these muffins Nick! Thanks so much for commenting that you enjoyed them! 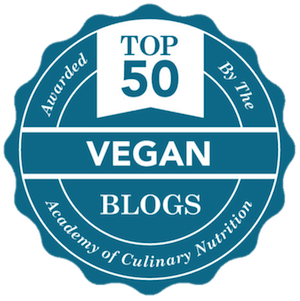 I’m excited for you to try them! 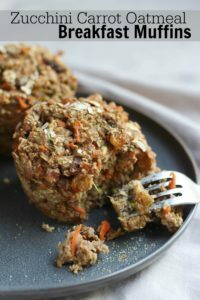 I haven’t made these exact muffins in regular-sized muffins tins before, but you will definitely want to adjust the cooking time down. I would guess baking them for 18-22 minutes would work! Just check them and bake until a toothpick inserted into the center comes out clean. Would love to know how long you end up baking them for for future reference! Thanks Barbara! I feel like there is more add-ins than actually batter! Just how I like them:) Thanks Liv! Those muffins look so good and healthy. I am making them today:) Thank you! Delicious and healthy is right Tracey! I hope you like them as much as I do! Wow these look and sound so good! Will be trying them. Thanks so much Arlene! I’d love to know what you think!